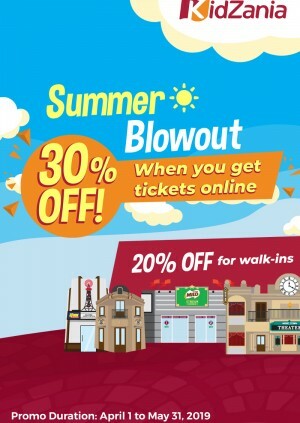 Promo Details: - Get 30% OFF on KidZania Manila tickets through online sales channels and 20% off via walk-in counters Promo Mechanics: - The promo is open to all visitors of KidZania Manila - The promo entitles ticket discounts based on the purchase channel: - online: 30% off - walk-in: 20% off - A visitor can only purchase a maximum of 10 tickets (minimum of 2 kids for every 10 tickets). Additional tickets on top of it shall be charged the regular published admission rates, or may avail of the group discount thru the Sales Team. - Purchased tickets are non-refundable, but transferable and rebookable within the promo validity period only. - Promo cannot be availed in conjunction with other promos or discounts. Not valid for official school field trips, corporate events, parties, and special events. - In the purchase of goods and services which are on promotional discount, the Senior Citizen may avail either the promotional discount or the discount provided under the expanded Senior Citizens Act of 2010, whichever is higher. - Please call KidZania Manila's Visitor Service at (02) 711-KIDZ (5439) or email ticket@kidzania.com.ph at least one (1) day prior to your desired date of visit to check for availability of slots. - Visitors are advised to visit manila.kidzania.com for the most updated schedule.